Although some may think that the paternity of a child means very little in this day and age, it can actually matter substantially. Several legal benefits for the child are attached to the issue of paternity, including eligibility for benefits like Social Security or veteran’s benefits on their parent’s work record. In addition, paternity affects child support and visitation. It also gives a parent the opportunity to be involved in their child’s life in a significant way, without the fear that such contact could be unceremoniously terminated. Several factors that may or may not be present in your situation, however, make establishing paternity easier or far more difficult than previously anticipated. In Nevada, a child born while their mother is married is considered to be the husband’s offspring, absent any clear and convincing evidence to the contrary. If the child is born out of wedlock, paternity must be established via one of several methods. Obviously, it is easiest when both parents agree on the identity of the father, and if they do, they can complete the requisite paperwork to put that on the legal record. In Nevada, paperwork is called a Voluntary Acknowledgment Form (VAF), and it must be signed by both parents in the presence of a notary public. This does not have to be done immediately following the birth, though it is common for hospitals to assist with the signing and filing of such paperwork. Nevada law does permit a person who signed a VAF to rescind the acknowledgment, essentially holding the VAF null and void, as long as they do so within 60 days of signing, or before the start of any proceedings involving the child in question. If there is disagreement as to the identity of the child’s father, a paternity suit may be brought in order to determine paternity. The mother, the putative father, the child or the child’s legal guardian (who may be a state organization, such as the Nevada State Welfare Division) may bring a paternity suit in the relevant court, or they may ask an administrative judge to handle the proceedings surrounding DNA testing. If this does occur, both alleged parents and the child will likely be asked to contribute, and if the alleged father refuses, this may be used as evidence of paternity – the rationale being that the man may have something to hide. A man is determined to be the child’s legal father if there is a 99 percent DNA match, with extremely rare exceptions. However, it is important to remember that paternity does not grant an automatic right to custody or visitation. A father must initiate the relevant proceedings in district court in order to be granted either; paternity merely grants the right to ask for them at all. Once paternity has been established, the father must show to the court’s satisfaction that he will not place the child or children in any situation where their well-being might be compromised. 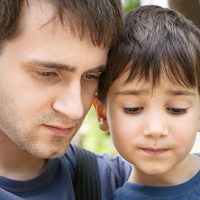 If the paternity of your children is in dispute, it is in your children’s best interest to have the matter settled as soon as possible. A knowledgeable paternity suit attorney can help answer your questions and guide you through what can be a time-consuming and confusing process. Contact the lawyers at the Kainen Law Group today to set up an initial consultation.